Here she come! Frances Barkley in the fog. The answer to make Bamfield is one of our favourite place to anchored. House for sale in Bamfield. Doctor fly seaplane to check patient in Bamfield. 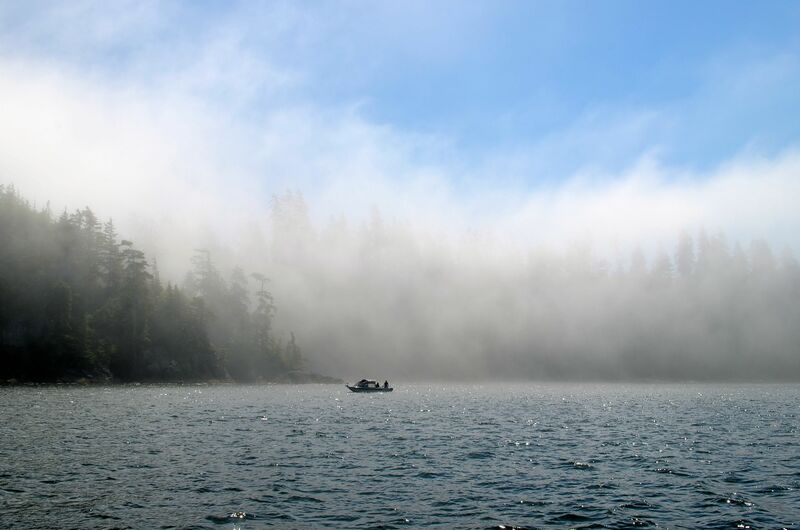 July – August salmon fishing season. So we have been waiting in and around Bamfield. Trying our hand at fishing, and perfecting how to eat a whole Tuna before it goes bad! I have had and am still having medical tests. Have not bothered to go for the results yet! Still waiting is better than knowing. I am pretty certain what the new tests will say, much the same as the old ones probably. Luksana has been applying for jobs, if she was willing to stay long term, she could probably get a nice chefs job. However no luck so far. Talking about no luck! Now in the world of today, with death, disease, war and terror our problems are very small. However I do feel that my name should be changed to Murphy. Let me explain. In order that Luksana be allowed in the States she had to apply for a visa. So form filling and $160 down and we then have to plan for our trip to Vancouver. One option was to take BS back around the coast to Vancouver. Obviously this did not appeal very much due to the distance and the costs involved in time and money. So we decided to Sail BS to Port Alberni. A 6 hour passage down the Alberni Canal. Then rent a car by 5pm, when the sole rental shop closed, and then drive to Nanaimo. From here we would catch the 9pm ferry to Vancouver. Crash for the night in the car at the other side then drive to the US embassy the next morning for the 9am interview. After the interview we would return the same way that evening. Simple plan and doable. The cost would be similar to sailing round but much simpler. Ya right, tell that to Murphy! Left Bamfield 8am and made about 8 miles before lost all of the oil from the engine. A very thin plastic line that connects the sender to the oil pressure gauge decided to crack. I was lucky that my habit of constantly checking the gauges, at least stopped the engine from seizing. 2 hours and 2 gallons of oil l later Luksana started to sail the boat. My first fix lasted about 10 mins, just long enough to spew the replacement oil out of the engine block. The wind was light but pushing us in the right direction. I realized that I needed parts to fix the engine so we headed on at 1-2 knots. The wind did get stronger, but our 5 pm deadline to rent the car was lost as we arrived in Port Alberni in a full gale, Sailed onto the first safe [seaplane dock] at 5:55 pm. That of course meant that we had missed our connections. As the car hire place closes at 5 pm. Which meant we had paid for the US Visa interview which we could not attend. Had to wait for a 2 days for parts and then Leave Alberni to head home [Bamfield], much lighter in the pocket and still no further ahead. We both agreed that Alberni was not one of our most favourite places. it is a sprawling community, struggling to cope with the decline of it major industries. It is set up for large vehicle traffic not foot passengers from broken sailboats looking for parts. We lucked out with the weather, it was rainy but the inflow winds did not start until we were within a few miles of Bamfield. It was nice to feel the Ocean swells again under the boat and nice to drop anchor in what has become, by default our home away from home. Lots worse places to get stuck. 08:00 am Leave Bamfield Cloudy day we motoring BS out of Bamfield. 05:30 pm Docked at Port Alberni, Emergency docked at Seaplane slip Our first time to Port Alberni, Very warm climate and windy that normally arrived in the afternoon. We take a walk near the Harbour which part of this town is already run down. The atmosphere of this part is not warm welcome and very quiet. Most shops were closed down with a sign for sale or lease. Some shops still survived for local and tourist nearby the Harbour. To go to the new development part of town in the other side is quite far away to walk from this shopping place back to the harbour. Still can get there by taxi, bus stop in some location. We walk back from shopping place back to harbour. 09:15 am Leave Port Alberni 03.00 pm icon-anchor in Bamfield Inlet Restart again!